The Davis-Harrington Welcome Center, located at the intersection of E. Bear Boulevard and National Avenue, is used as a polling place for all Greene County voters on Election Day. 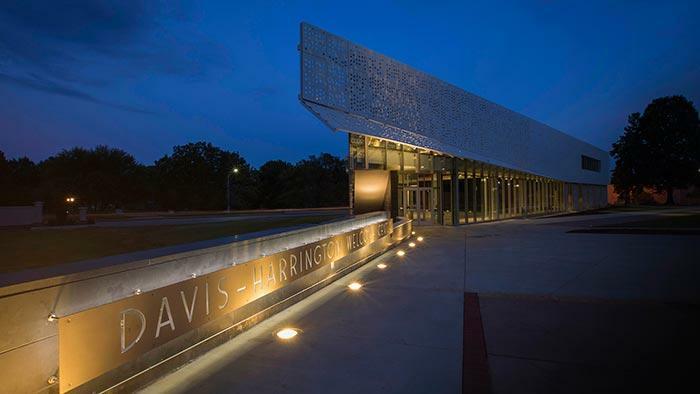 In this segment of Engaging the Community, Missouri State University President Clif Smart talks with KSMU's Jennifer Moore about the decision to use MSU's Davis-Harrington Welcome Center as a general polling place on Election Day. That means all registered Greene County voters will be eligible to cast their ballots there. As Smart explains, the facility will have special accomodations for voters with disabilities, including the visually impaired. The facility is located at the intersection of National Avenue and E. Bear Boulevard on the MSU campus in central Springfield. Listen to MSU's president Clif Smart talk about the Greene County general polling location.